VersaMail is the Email client that ships will all the present Treo and Palm Handheld models. It’s descended from a product called MultiMail, a text-based email program Palm bought a few years ago. 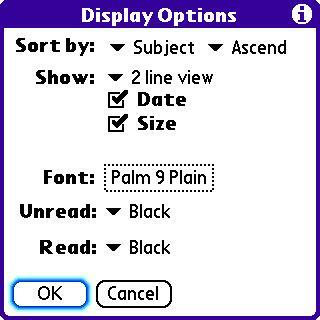 Palm has been steadily enhancing it, like adding some support for HTML mail, adding Exchange ActiveSync support, and other features. For those carriers offering Palm’s Blackberry Connect, it is also built on top of VersaMail to offer push e-mail, contacts and calendar events. It presently supports POP3 and IMAP, and it supports SSL and authenticated sending (ESMTP). It also supports configuring non-standard ports for sending and receiving mail (which some providers now use to combat zombie PC’s sending spam). It will then dump you back into the last program you were using. If you’re lucky, you can just go back into VersaMail and it’ll work fine. If you’re not lucky, you have to use other tricks like going into VersaMail and quickly switching mailboxes by hitting the hardbutton twice in succession (assuming you have two accounts set-up). In the worst case I’ve ever had (which has only happened once), I’ve had to delete all the VersaMail databases, and then re-create the accounts and re-download the mail again. Because I use server-based IMAP for my mail, and I leave a copy of mail on Yahoo!, I didn’t lose any mail during that whole mess-up. 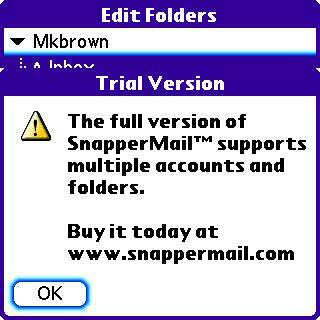 ChatterEmail was built from the ground up to be a Treo E-mail Client. It has a 30-day trial period, which I used for the entire period in order to really get a feel for it. The version I used was 3.0.4rc1, which means it’s a “release candidate” or late beta product. One nice thing about Chatter’s trial period is that you can still access your stored e-mail when the 30 days are up; you just can’t send and receive anymore. The latest version of ChatterEmail (as of this posting date) is 3.0.6. J for Junk e-mail (if you have a Junk mail folder defined). This beats the menu + key or on-screen buttons approach used by VersaMail, as it eliminates one keystroke or stylus tap for each mail you deal with. That can be a big time-saver for e-mail power users. As you can see below, the button bars in Chatter are a little cleaner, being icons; VersaMail only implements text buttons. VersaMail has problems with some forms of message encoding. The message below originated via a mailing list that adds a “signature block” automatically to each message sent via the list, and usually the messages on this list get sent via the mailing list software as an attachment. 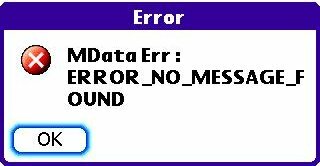 The same message is displayed below. Note how Chatter picks it up as an attachment (message.txt), whereas VersaMail doesn’t show anything but the signature block; this might lead the recipient to believe there was no message actually sent. Does this mean that Chatter handles e-mail better than VersaMail? Not exactly! Chatter seems to have issues with truncating messages (cutting them off prematurely). Chatter has a preference, like VersaMail, to set a limit on how much of an e-mail is retrieved when it syncs with the server. If a message is only partially fetched, both programs give you the option to “get more” of the message, which should download the entire message. With VersaMail, when I select that option, I usually get the entire message (although VersaMail too has problems with truncating large messages). With Chatter, when you select a message to get more, it would indicated it retrieves the entire message, but it is very obvious it did not (VersaMail has the same problem on really large messages). These truncations happened more frequently on Chatter than on VersaMail, on mailing list “digests” of more than 50KB in size. Usually, VersaMail only has problems with messages of 64KB or larger. Other than the size issues, Chatter does generally handle e-mail messages of varying types of formatting better than VersaMail. If you don’t do large digests, Chatter is definitely the better of the two for message viewing. In the mailbox view, many of those same shortcuts apply when a message is highlighed or selected. The only ones I felt were missing that would make it even more usable are T and B, to go to the Top or the Bottom of the mailbox view, like the Blackberry does in it’s email client. Given that T is already taken in that view, it’s understandable. Holding the option button down while rocking the 5-way up or down will advance through the message view by pages, rather than individual messages, so that does help somewhat. But, if you routinely keep a lot of mail in your mailbox, it would be nice to have one-button jumping to the top or bottom. Given that VersaMail has none of these one-button features, Chatter is a huge step up in terms of usability. Another possible shortcoming in Chatter is that you can only sort the mailbox view by date received, either ascending or descending. There are no options to sort by sender or subject, which can be useful for dealing with large amounts of email. I personally like sorting my Yahoo account by subject, since that will group similar messages together, as neither program supports threading. Since Chatter’s target market is for people using push e-mail, where you typically deal with it as it arrives, this may not be much of an issue for those people; those who get mail periodically, and who get a lot of it, may find it painful to process. VersaMail does allow for sorting by sender, subject, and date received, so I have to give it points for catering to peoples different styles of processing email. VersaMail stores it’s messages in your handheld’s memory, whereas Chatter can be configured to store it’s mail on the SD card. 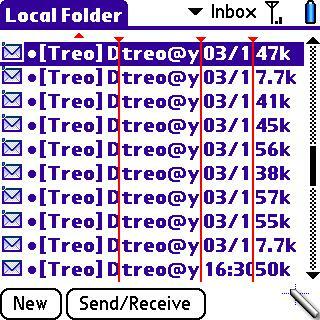 This can save you a lot of memory if you’re on a Treo 650 and want to keep a lot of mail with you. Chatter keeps a message index in memory, but not the actual messages, so it doesn’t eat up a lot of space if you have a lot of mail. The flip side is that VersaMail is in ROM (Read Only Memory, or what’s built-in from the factory), whereas Chatter has to be stored in memory in order to work (I’m not going to get into the whole topic of ROM hacking here). So, in practice and depending on how much mail you deal with, the Chatter program may take up as much memory as what VersaMail uses for it’s message database. If you want to carry 6 months of mail with you, Chatter’s the way to go; otherwise, you can’t weigh the memory aspect as heavily as other usability factors. Chatter does offer mailbox encryption on the SD card, but it’s not strong enough to withstand someone who’s determined, so it shouldn’t be relied on to protect state secrets and such. Chatter has a nice feature for IMAP accounts called filtered mailboxes, which for some could be a workaround for the “sort by subject or sender” issue above. Basically, it’s subfolders on an IMAP account that have configurable filters, message handling and alert options. You can configure how often filtered mailboxes are synced (if done automatically), and whether or not you are notified of new mail in that box. There is also an option for SMS triggered syncs; that mailbox will sync when you receive an SMS containing a text message you configure. That’s a handy feature for automated message systems , server-side filters, or voicemail/faxmail to email systems. 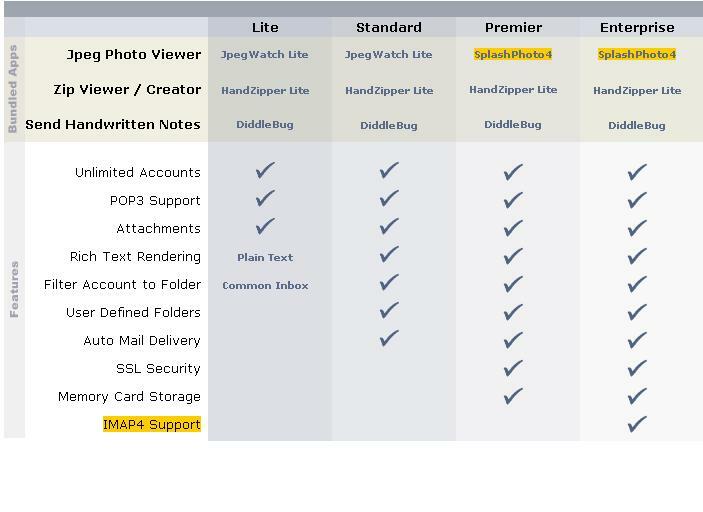 As far as overall IMAP feature support, Chatter handles subfolders in subfolders; Versamail only handles first-level folders (no subfolders), and does not have custom options per folder (just per-account settings, unlike Chatter’s filtered mailboxes). Chatter also supports message flags (see the picture above where the background of an envelope is red or flagged), whereas VersaMail does not. Both products will synchronize read/unread status back to the server. 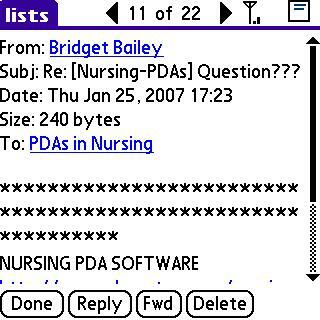 Chatter supports configurable options for where Sent messages are placed, and will sync the changes back to the server; that means that messages sent from the Treo will be stored in your sent folder on the server. The version of VersaMail I have does not. I’ve had to configure it to BCC a mail to mkbrown+Sent for it to be kept on the server (I use something called “address extensions” to deliver mail to certain folders automatically). 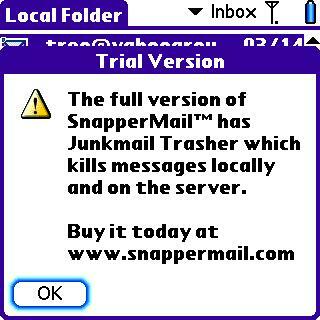 Chatter also has “junk mail support”, and if configured, it will sync the Junk to the Junk folder on the server; VersaMail, nope! Another nice thing about Chatter is it’s status area (see the mailbox view above where it shows off-line). It tells you if there’s no signal, what’s happening (Auth, Login, number of messages, etc), and it will highlight other accounts that have messages (see the red mkbrown in the picture above). Versamail uses progress bars (a blocking operation, meaning you can’t do anything while it’s working) and the standard antenna bars for radio status and signal. Chatter supports background operation, which is it’s secret for letting you get on with using your device while it’s fetching mail in the background. It works pretty well, but will sometimes reposition the screen if you’re reading a mail at the same time it’s updating the status area. Annoying, but not a big deal when you consider you can do something productive while it’s grabbing mail in the background. 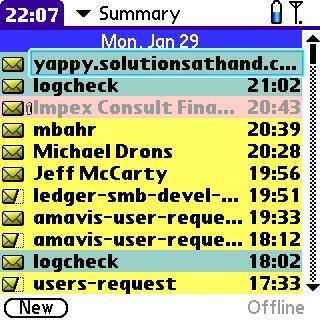 Chatter also has a summary view, which incorporates e-mail from all the configured e-mail accounts you choose into one page. I personally didn’t find it very useful, as I prefer to deal with one account at a time. You, on the other hand, may think it’s just amazing and makes you want to buy Chatter right now. It’s an optional view, so if you don’t want it, you don’t have to use it. VersaMail doesn’t have anything like it. You can see it below. So, what do I miss most about ChatterEmail now that my trial period is over and I went back to VersaMail? HTML message viewing, one button operations, IMAP subfolders, and message flags. Those were the features I liked most about Chatter, for use in my particular situation. I don’t use push e-mail, so it wasn’t a deciding factor for me. Being able to file messages wherever in my folder hierarchy was top-notch in my books, as was being able to flag them, neither of which are features that VersaMail supports. What do I feel was missing from Chatter, that would have made it more usable for me? Sort by Sender or Subject in the mailbox view. That way, I can process e-mails, and delete entire threads if they’re read or irrelevant to me. As for product support, VersaMail is supported by Palm Inc., which means you get someone reading scripts and pasting form letters in a call center, who may or may not be able to help you resolve your problem, like many call centers these days. (Wake Up manufacturers! Customer SERVICE and SUPPORT means that the tech support people should know more about their products than the people who are calling for help, not the other way around!) 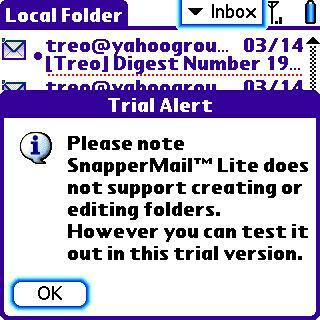 If you have a Treo, and the version of VersaMail you have is buggy, then you are at the mercy of your cellular service provider as to whether or not you will see a firmware upgrade or software update for your device which MAY fix any problems you’re having. Otherwise, Palm sells an upgrade version of VersaMail (3.5, which ships on the Treo 700p and 680), which MAY fix any issues you’re having with older versions of VersaMail. But, in the case of 3.5, you’ll have to pay to find out; there’s no trial for it. I’m running 3.1F myself on my Bell Mobility Treo 650, and I had to hack my ROM a while back using the Telus ROM update to upgrade my VersaMail from 3.1b to 3.1F, because Bell Mobility avoids ROM upgrades like the plague. They want to sell phones like appliances, so it’s not their problem if something goes wrong; and besides, it takes them months – if not a year – to qualify a phone on their network before it becomes available, so the product may no longer be in production by the time they’ll consider qualifying a ROM upgrade. Bell’s network is stable and the coverage is good, so the price you pay for that is to not expect to get a ROM upgrade (ever!). Chatter’s support has been excellent up to the end of February of this year. Marc Blanc, the author of Chatter, runs a support forum on his website, and he also frequents a lot of palm mailing lists providing support to his users. Marc is very passionate about his product, and solicits feedback and feature requests from his users, which he then rolls into new releases of ChatterEmail. Upgrades to Chatter have historically been free of charge, and rapid, because Marc believes in a “release early, release often” approach to software development. Now, let me clarify something; I’ve been talking about “historically” and “up to February” because, in a forum post here , Marc reveals that he will no longer be actively developing ChatterEmail, as he has accepted a position with Palm Inc. Marc has said that Chatter will still be available for purchase, and that support would continue to be provided, albeit not as it has been in the past, as he is transitioning Chatter to a different support structure and distancing himself from it, which is likely a requirement of his accepting the position with Palm. Congrats to Marc on his new position, and kudos to Palm Inc. for picking up a talented and vibrant developer from the Palm community. I can only hope Marc’s talents are being applied to address VersaMail’s difficiencies (as well as related PalmOS flaws). Given that Marc is not longer actively developing Chatter, would I still recommend it? Yes! Marc has built up a supportive community around his product that rivals that of another extraordinary developer and product, C.E. Stuart Dewar and Pimlico Software’s DateBk6 (which I’ve used since DateBk3). Marc has committed to his users in e-mail posts that future PalmOS devices will be supported, and I’m confident that the product will continue for the foreseeable future. Now, it may seem like I’m bashing VersaMail; well, it does have it’s flaws, but it’s still a very usable e-mail client. Many people don’t even load a third-party piece of software onto their Treo’s or Palm Handhelds, so they don’t have the first clue as to what other options they may have. The point to this E-mail Round-up series is to show what’s out there, and what each program’s strengths and weaknesses are. 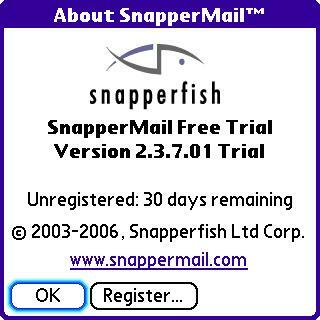 Next in the series will be VersaMail vs SnapperMail2; expect to see that around the end of April, as I’ll be giving Snapper the same 30 day shakedown cruise as I did for Chatter. Feel free to ask questions using the comments section below; I’d be happy to give my two cents worth (Canadian). I’ll be doing a post in the near future about Syncing options for PalmOS products, so stay tuned! Update: You can find part 2 in the series, VersaMail vs SnapperEmail, here. E-mail is a mainstay in today’s mobile devices, and the Treo is no exception. The Treo product line ships with the VersaMail Client (now just called Email on the newest Treo’s like the 680 and 700p), but how good is it, and how does it stack up to the competition? That’s what I’ll be covering in the next three or so posts in this series, but from the point of view of an individual or small business. There are other products out there that replicate the Blackberry experience, like Goodlink and Palm’s Blackberry Connect, but those products are usually deployed by large organizations, so individual users don’t have a choice in the matter. I’ll be doing these reviews in a series of comparisons, because everyone’s needs for email are different. These reviews aren’t about finding the “best” email client; there is no such thing. By comparing the various email clients to each other in real world applications, it can help you find the best application for your needs and situation. In order to test these applications, I’ll be using my own IMAP mail server, as well as a Yahoo! 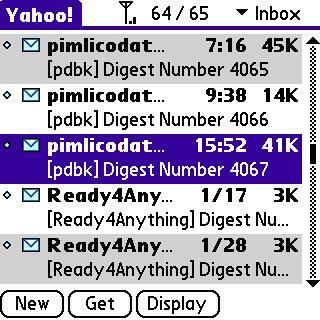 POP account I use for a multitude of mailing lists, both individual messages and digest modes. 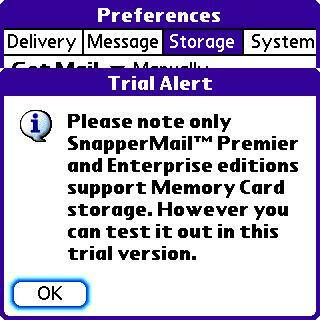 I’ll be comparing the third-party e-mail clients against VersaMail, which is what installed standard on the Treo. For some background information, E-mail is client-server relationship. E-mail gets sent from a client on your PC or Treo to your provider’s server, then passed through a few other servers on it’s way to it’s destination, the recipient’s server. The recipient would then use a client software package to get that e-mail. There’s two major ways of getting e-mail. The first is called POP3 or Post Office Protocol version 3. POP3 is generally what most providers supply with Internet Service accounts, and it’s the protocol used to access webmail based accounts like Yahoo or Gmail. It works much like a physical “snail mail” mailbox: mail sits there until you retrieve it, where it is then moved into your inbox on the e-mail client. It is possible to configure your email client to leave the original in your mailbox on the server, and merely fetch a copy into your mail program’s inbox, but that is not typically the default. The Yahoo account I’m testing with will be keeping the original, and the various clients I’m using are configured to get a copy. POP3 accounts are generally not intended for the long term storage of e-mail (although Gmail is an exception). IMAP is a different beast. It’s a system that is designed to store e-mail permanently on the server, and therefore it has tools to make it beneficial to do that. IMAP supports folders, and folders within folders, so you can make a filing system that works for you. Your email program works with a local copy of your email “filing system”, and any changes you make are propagated back to the server. Many IMAP server installations have server-side tools to filter e-mail based on a multitude of criteria, and this filtering is done as the mail arrives at the server. This can be a huge time and money saver; let’s say you frequently receive mail of a routine or non-urgent nature. That type of mail can be filtered into a different folder than your Inbox (like “Read later”) that you read when your at your desktop PC. That makes getting your inbox mail faster, as you won’t have to wade through all your mail, and you won’t pay for retrieving email you don’t need to read immediately (for those that pay per kB transferred). Typically, email is “pulled” from the server to the client, as the client “polls” the server. Think of it along these lines: The client says “Hey, got any mail for me?” every 15 minutes. The server will respond either “nope”, or “yup”, in which case the client says “Ok, gimme”. 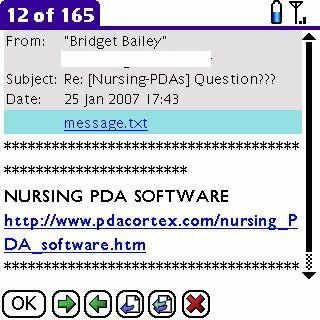 Push e-mail like the Blackberry basically shoves email out to the mobile device the moment it arrives at the server, eliminating the delay of polling for mail every ‘x’ minutes (no more “is it here yet?”). It’s like having the mailman running your mail to you every time a letter shows up at the post office. With the Blackberry or Goodlink, this involves having a dedicated server which talks to both the mobile device and the mail server, and acts as a go-between. This integration typically requires a significant investment in both money and IT infrastructure, which is usually reserved for larger organizations. For individuals looking for push email on a smaller scale, some e-mail clients are supporting an IMAP server feature called “IDLE”. It’s like keeping a phone call (connection) open so you can talk to someone right away, when you need to. Most of the time the connection is idle (meaning you’re not paying for data transfer because your not actually sending or receiving mail), but your email willl come through right away when it arrives because the connection to the server is still open. The IDLE feature is particularly handy if your existing IMAP server supports it: you just buy an e-mail client that supports IDLE, and you have instant push email on your existing infrastructure, with minimal costs and fuss. Reading and replying to email sent to me personally that is in my Inbox (IMAP). I find that mailing lists are a great way to test email clients. The sheer volume of people from around the world, using a multitude of email programs (with varying levels of compliance to the specifications of technically correct emails) ensures that the program I’m testing has a wide range of samples to go through. The emails will be a range of plain text, text digest, HTML, and multi-part mixed. 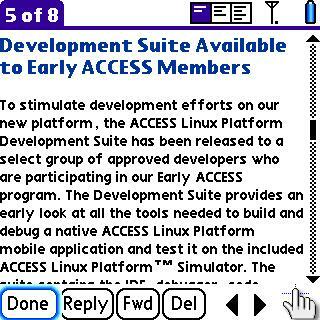 Text digests nice torture tests for portable email clients. The mailing list software is supposed to reduce HTML or rich text messages to plain text, but sometimes things happen where a mashup of plain text and HTML codes get sent through, and some e-mail clients just choke up trying to handle the mashup. So, stay tuned for the next post in this series, where I’ll be talking about my baseline for comparison, VersaMail, and how it stacks up to ChatterEmail. 2007-03-15 Update: You can find part 1 in the series, VersaMail vs ChatterEmail, here. 2007-08-24 Update: You can find part 2 in the series, VersaMail vs SnapperEmail, here.